Our Flag Too is a social enterprise* that Carl founded in late 2016, after Trump’s election. The image you see here will be sold in an online shop in a variety of media (cups, bumper stickers, tee-shirts, yard signs, buttons, etc.). One hundred percent of profits will be dedicated to organizations like Planned Parenthood and the American Civil Liberties Union that protect people, principles and causes at special risk because of the incoming regime. Launch of the online store is scheduled for the first quarter of 2017. Why the Our Flag Too image? The safety pin symbolizes solidarity with potentially oppressed groups. The American flag speaks to our resolve to defend the precious values that underpin the American Dream—values like equality, respect, opportunity and freedom. 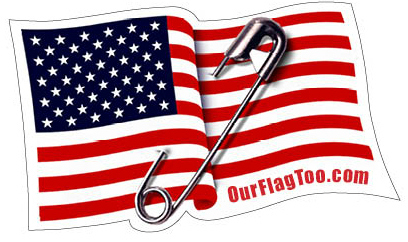 By proudly displaying the Our Flag Too badge, we reclaim the American flag and attach it to a kinder, wiser narrative. *Social enterprise: A business with equally important service and profit missions.